The news around the world is sadly full of the stories of war, terror attacks and the ‘refugee crisis’ at the moment and this is reflected in many discussions in the international development sector. This is similarly reflected in the aid strategy announced by the UK’s Department for International Development (one of INASP’s major funders) late last year, which included a particular emphasis on fragile states. At face value, this might seem somewhat removed from INASP, an organization that works to support the production, sharing and use of research and knowledge in the developing world. After all, as I shared in a recent blog post, when countries are struggling with a disaster or crisis – be it an epidemic, a natural disaster or conflict – there is an inevitable focus on immediate humanitarian concerns rather than research and knowledge. But immediate humanitarian needs – essentials like food, clean water and shelter – are only part of the story. People can spend many years as refugees. The often-quoted ‘average’ of 17 years is over-simplified and laced with caveats (it originates in an internal UN report as an estimate for the situation in 2003, in comparison with an estimated average refugee time of nine years a decade earlier, and therefore predates the recent situations in Syria and elsewhere). However, the message is clear: being a refugee is not a short-term situation. In 17 years – or even nine years – there is plenty of time to do a degree or two, a couple of post-docs and get a lectureship position. There is also plenty of time for a research topic to go from the germ of an idea to a real innovation that is starting to make a difference in people’s lives. (For more information about the implications of protracted displacement, this paper by development organization ODI is interesting). And fragile or conflict-affected states often take many years to stabilize, reconstruct and advance in their development. In short, those refugee or crisis years can be a very long time for an academic and a long time for research. There is an awareness of the need to support displaced academics and significant work in this regard is being done by organizations such as CARA. Keeping skills and knowledge up to date is also important and INASP supports researchers in developing countries to access the skills and training that may not otherwise be available. Such skills include research writing and, this April and May, INASP’s AuthorAID project ran our latest – and largest to date – online research-writing course. 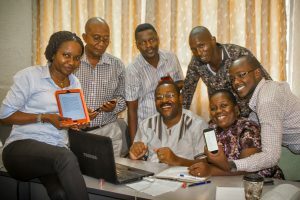 Online courses are one way that AuthorAID supports developing-country researchers in improving their research writing. Research carried out in developing countries can inform local and international development challenges and policy and practice. However, researchers in these countries often struggle to get their research published and communicated to a wider audience. This can result from a lack of familiarity with the international publishing system and suitable journals; limited experience in writing scholarly articles; a scarcity of experienced academic mentors; and the need to write in English, often as a second language. With over 3,000 people initially signing up and over 1,000 active participants from more than 50 developing countries, our latest online course had an impressive reach and definitely falls into the category of a MOOC (massive open online course). But, for me, perhaps more exciting than the big numbers were some of the people behind the numbers. We already know from previous courses that our online courses are particularly attractive to female academics because they often face particular challenges in their work and may find it more difficult than male researchers to attend workshops away from home. Edith Wakida, a research administrator at Mbarara University of Science and Technology in Uganda who took an AuthorAID online course on grant writing in 2013 explained the challenges to the scientific news organization SciDev.Net. “Women have multiple responsibilities with work and family. Sometimes they can’t think of taking time away from their job and their children,” she said. Taking an online course enables such researchers to study at a time that fits around family life. The positive response from female researchers on our online courses in particular, is exciting for INASP as supporting gender equity is a major focus of our on-going work and plans. We also have evidence that our online courses are accessible for visually impaired participants. 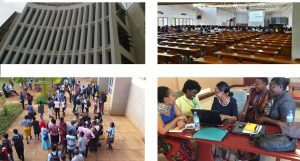 Last year, for example, a blind academic at the Open University of Tanzania successfully completed our online course using voice recognition software, meeting the same completion criteria as the rest of the participants, for example passing all the quizzes. Particularly relevant to the UK’s new aid strategy is the interest we see from regions of the world that have unrest and conflict. Our last online course had significant numbers of participants from Afghanistan, Yemen and Somalia. 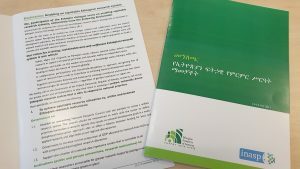 It’s not without challenges; the drop-out rate from Somalian researchers, for example, is quite high, often as a result of poor internet connections (see here for our recent analysis of the research and knowledge system in the Somali regions). But we also have some excellent success stories: mental health researcher Dr Djibril I. Moussa Handuleh was a successful participant in our online course about three years ago and since then he has become a notable researcher and mental health practitioner in Somalia. He recently shared his story in a PLOS mental health blog. Another interesting aspect of our latest course is that a small number of participants are refugees. These academics are currently displaced from their homes and usual workplaces but are using courses such as our online research-writing course to continue to maintain and update their research skills. Such offerings are so important if we want to go beyond short-term humanitarian needs to longer-term development, supporting those individual academics to keep their skills up-to-date and, by extension, to support their research and the potential impact of their research. Going forward, INASP hopes to support more refugee academics, particularly through our online courses. The latest online AuthorAID course finished on 12 May. We look forward to hearing about and sharing some of the researchers’ stories over coming months.